SCAC, CAC, AATAC, what does it all mean? New emission regulations have led to massive changes in the way diesel engines are cooled. Older engines had a single jacket water circuit (using a mixture of ethylene glycol and water) that was responsible for removing heat from the engine and transporting it to a radiator. Simple enough, right? Fast forward to today! Engines are now equipped with separate cooling circuits, aftercoolers, charge-air-cooled circuits and even oil cooling circuits. This article will describe some of these systems, and the radiators used to cool them. Let’s begin with the most basic, the single jacket water circuit. Here, the cooling fluid is circulated through internal passages in the engine block to extract and carry away some of the heat produced by the combustion cycle. It is a single circuit because all cooling water is circulated by a single engine-mounted water pump. SCAC stands for “separate circuit after-cooled“. This technology circulates jacket water in the normal manner, but a separate water circuit is added to cool the engine’s intake air after it is pressurized by the turbocharger. By circulating cooling water through the aftercooler, the engine is able to operate more efficiently and produce more horsepower. 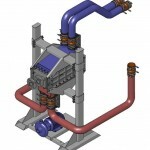 This system uses two engine-mounted water pumps, and each circuit is pumped to an individual radiator core for cooling. ATAAC stands for air-to-air-aftercooled, also known as CAC (charge-air-cooled). This system uses forced-air (instead of water) to cool the turbocharged air before it enters the engine’s combustion chamber. Similar to the SCAC design, the goal is to lower the engine’s intake air temperature to improve emissions and output power efficiency. 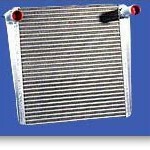 So, how do these systems affect external heat exchangers (radiators)? Engines equipped with a combined jacket water and aftercooler circuit are fairly straightforward. There are two water circuits, each piped separately to a radiator with a split core, or a with dual, stacked cores. When using a remote radiator (not engine-mounted), the engine’s water pump and aftercooler pump head limitations have to be considered. In the worst scenario, shell & tube heat exchangers are used to circulate the engine circuits, and auxiliary pumps are used to circulate the cooling fluid to the remote radiator. This is referred to as a dual-loop remote radiator cooling package. Engines equipped with charge-air-cooled circuits are a bit more complicated. The charge-air circuit is very susceptible to even the smallest pressure drop in its piping system. This requires that a minimal distance exist between the engine and the charge-air cooler. While set-mounted radiators are most common, remote radiator packages are sometimes required. 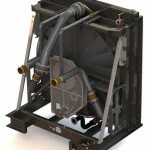 In these instances, a liquid to air, charge-air cooler airbox assembly is installed by the engine. This assembly is then piped to a remote radiator, with auxiliary pumps providing the necessary circulation of coolant (watch a video demonstration). 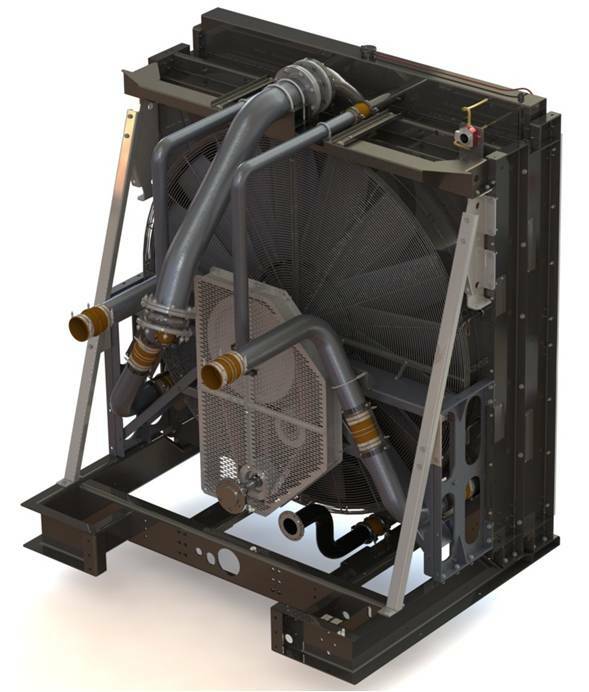 Engines equipped with SCAC designs employ a stacked core radiator (a single radiator assembly with two stacked cores) or split-core radiator (a single radiator assembly with side-by-side cores). Each core is connected to the corresponding circulation pump (JW pump for jacket water core, and AC pump for the aftercooler core). In remote radiator applications, pump head limitations may require the use of auxiliary pumps and shell & tube heat exchangers. 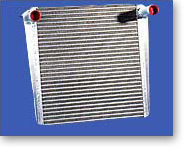 if the radiator will be engine-mounted, be sure to account for temperature rise across the engine (i.e. : radiator operating temperature = ambient air temperature plus any temperature rise observed as the air flows over the engine). calculate airflow requirements and radiator maximum external static resistance limitations. Communicate this information to the radiator duct fabricator and louver vendor to ensure that the radiator airflow is not excessively restricted. for remote radiator applications, a mechanical engineer should calculate pressure drops associated with the piping runs from the engine to the radiator. These values should be compared against the engine’s water pump data sheets. when it comes to cooling systems, different engine manufacturers often apply substantially different technologies for the same engine rating. A manufacturer that uses an SCAC design for a given rating may compete against another manufacturer using an AATAC design. If your project will bid competitively, your design should take into account the worst case scenario. 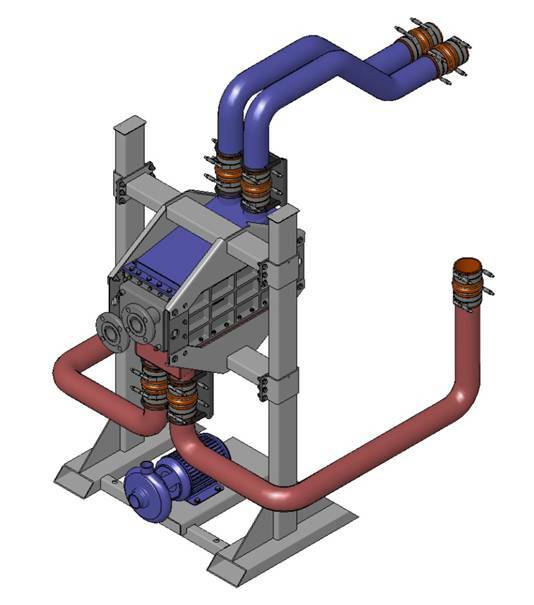 consult with various engine manufacturers or with an independent radiator manufacturer so you can be aware of any cooling system limitations that are critical for your design. How much exposure have you had with these newer cooling systems? Have you encountered a shortage of information on this topic? Please share your comments or questions. Why You Should NOT Rely Solely on Engine Silencer Attenuation Grades.